American Steel Span is a leading manufacturer of steel building installations. We offer easy to install buildings to suit your every need. Just follow our simple 4-step building installation instructions and you'll be enjoying your structure in no time. Steel building erection is simple, and takes very little time, which frees you up to do the things you love, and enjoy your new unit that much faster. With our high quality materials, you can get the job done right. 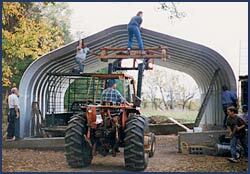 Our DIY steel buildings are the perfect solution for any of your needs. They take only a few extra hands and no special skills or trade are needed. We look forward to helping you with your unique project today! Materials can be found at your local building supply store. 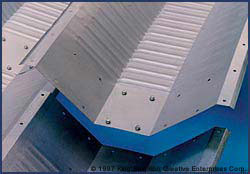 Our precision made arches fit perfectly and overlap to allow for fast and accurate assembly. 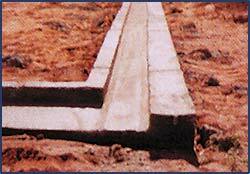 In most cases, no heavy equipment is required when raising your building. Our pre-cut, pre-drilled endwalls are easy to install with features like weather strip inserts and heavy-duty trim kits that guarantee a lifetime custom fit. "The installation plans were very simple and explicit; the site and form preparation left few questions. I used unskilled labor and minimum equipment to erect the building and it is beautiful and spacious. We placed three airplanes, two automobiles, a truck and tractor inside, with plenty of room to spare." "I had some reservations at first, but after receiving the building and starting the erection, everything you told me was true. We had no major problems in construction, and within 10 days our airplanes were sitting inside the new hanger." American Steel Span delivers quality, strength and service at factory direct prices on all custom or prefab metal buildings. 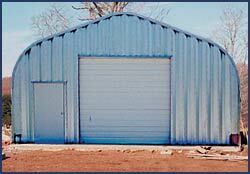 Call today for specials on our surplus steel buildings.